Zvartnots, a complex of structures erected in the middle of the 7th century near Ejmiatsin, is of extreme architectural value. The complex consisted of St. George temple or Zvartnots («vigil forces», «celestial angels») and the palace of Katholikos Nerses Ill, known as «Builder». 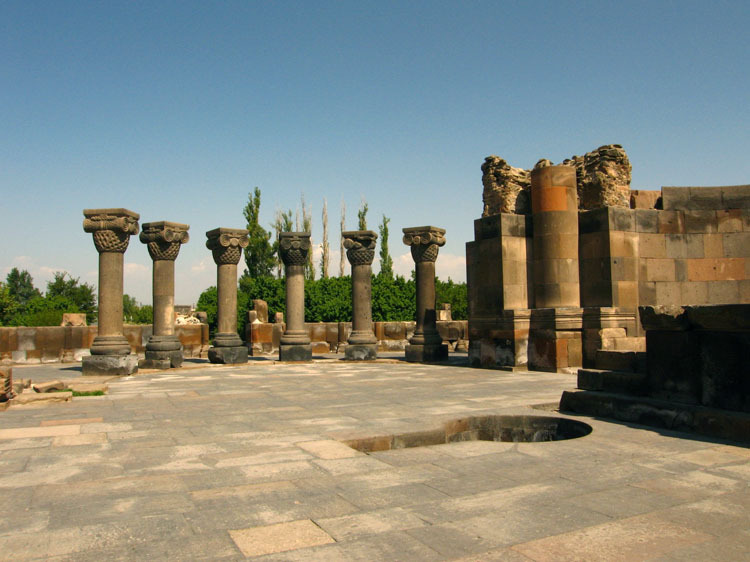 Zvartnots, buiIt as Armenias main cathedral in 641—661, was to suppress Ejmiatsin cathedral by its grandeur. This purpose was served by the original architectural composition of the building which is an example of a central-dome temple different in its appearance from the antique and Byzantine structures of this kind. The plan of Zvartnots is based on the composition of the central nucleus of Armenias cross-winged, dome-type structures of the previous times, that is the Greek cross. However, this cross is harmoniously fitted into a circle rather than into a square. Zvartnots architecture was supposed to impress the onlooker by its extraordinary artistic splendor. This determined the size of the temple, its layout and spatial arrangement, its structural features and its decoration which emphasized the central axis of the building and its upward sweep. The remnants of Zvartnots, even in ruins, are a majestic sight. There survived only the lower parts of the walls and individual fragments, and scientists reconstructions of the temples original look vary. 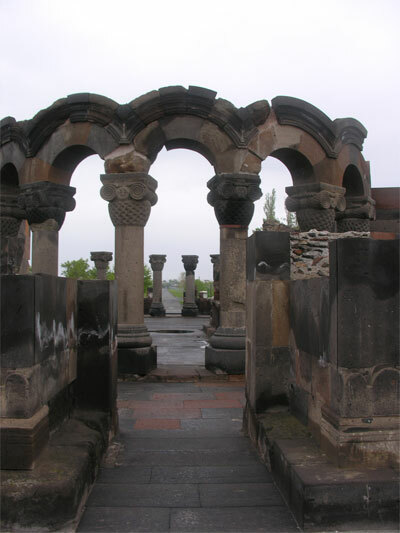 The decoration of Zvartnots temple followed the principle, common in the Armenian architecture of the 5th—7th centuries, of bringing out the basic architectural details:columns, door and window openings, cornices and archivolts. The outer surfaces of the polyhedrons, especially of the lower one, were ornamented with a rich arcature. The twin semi-columns were crowned with capitols with palmettes and acanthuses. On the whole, the motif of sculptural ornamentation, cut in high relief, was floral (a vine, stylized leaves, branches of pomegranate with fruit, etc.). Standing out among them were interior column capitols of an original composition, shaped as wicker baskets with volutes and a cross or a monogram (with letters standing for «Nerses» and «Katholikos») between them and decorated with the figures of rampant eagles which seemed to support the cupola - a symbol of the firmament. In the spandrels of the outer decorative areature of the bottom polyhedron there were half-length representations of men with building tools in their hands. Some researchers believe them to be portraits of builders (the name of «Ioann» is cut near one, presumably the main of them, on the archivolt), and others maintain these are the portraits of the founders of the temple. To the south-west of the temple there was the Katholikos palace which has also come down to us in ruins. It was a complex of capitally-built and regularly laid-out presence-chambers, dwelling, auxiliary and service premises. The scale, as well as the architectural and artistic features of the palace were coordinated with those of the temple.